My name is Eva and I am from Romania. I am a teacher of English and presently I am not working as I have a little baby girl and I am staying at home taking care of her. 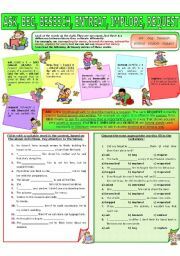 However, I am helping some children at home with their English. That is why I would like to use your site, as I am always looking for new materials to practice with them. COLLOCATION 53 - GALLOP, JOG, RACE, RUN, SPRINT, TROT. Are you tired? Hope not! ENJOY!!! Today it´s all about running and walking. So, here is the first COLLOCATION from today, about PLOD, STAMP, STOMP, TRAMP, TRUDGE. ENJOY!!! And the last one for today. 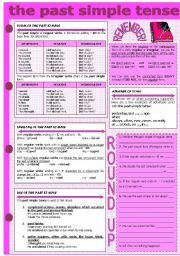 COLLOCATION - JAB, NUDGE, POKE, PROD, STAB. I hope today´s collection is not too violent .... so thanks for downloading it! First one today - COLLOCATION 58 - ASK, BEG, BESEECH, ENTREAT, IMPLORE, REQUEST. ENJOY!!! Second one for today: COLLOCATION 68 - DRAG, DRAW, HAUL, PULL, TOW, TRAIL. ENJOY!!! 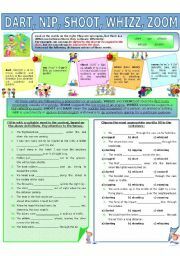 Three more COLLOCATION worksheets...First one, number 67 in the series - DART, NIP, SHOOT, WHIZZ, ZOOM. ENJOY!!! 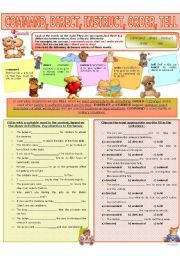 The third worksheet in the tenses series. 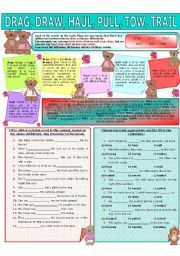 This time it´s THE PAST SIMPLE TENSE. 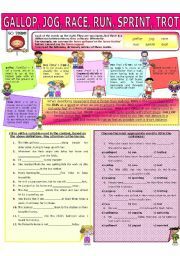 It has the same structure as the 2 previous ones: grammar presentation followed by 7 activities. 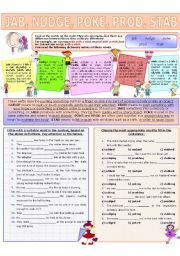 I also up-loaded today a worksheet about WH - words and asking questions in the past. ENJOY !!! 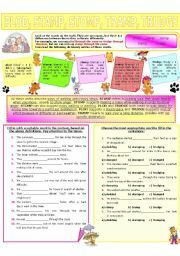 The second COLLOCATION worksheet today - COMMAND, DIRECT, INSTRUCT, ORDER, TELL. ENJOY !! !